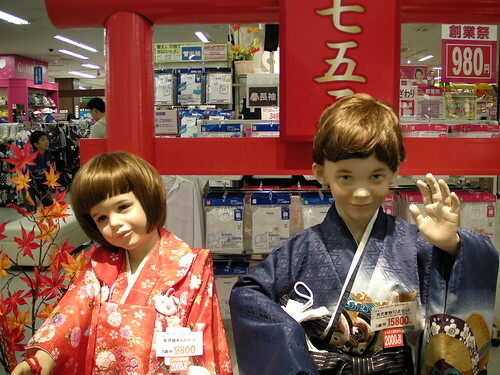 Western Mannequins Japanese Rite of Passage, a photo by timtak on Flickr. Even the display advertising kimono and hakama (traditional Japanese male formal attire) uses mannequins that are are at least partly Caucasian in appearance. This is partly because it is cool to look bi-racial, due to the economic influence of the West, and due to the universal human tendency to prefer average faces. It is also due to the way in which Japanese do not identify with self-narratives but rather with self-images. In Japan it is even more true that "Video Ergo Sum" (Lenggenhager, et al. ‎2007). If therefore Japanese mannequins were Japanese in feature they would appear eerily animate to Japanese shoppers, as do the status of Buddhas and Gods in Japanese temples and shrines. The use of Caucasian mannequins adds a element of distance, of inanimateness. To the Japanese, Westerners are a little like zombies or Gundam (robotic suits) with with they can identify - possess and control. I do not mean to suggest that the Japanese are always more "animistic" though. Westerners (or Westernised Japanese like Prof. Nakajima) are more likely to feel that phonemes are animate, and expect voices to be accompany by a person. A realistic mannequin is as creepy to a Japanese, as a person-less voice coming out of a Japanese bus, vending machine or ATM. Nakajima, Y. 中島, 義道. (1999). うるさい日本の私. 新潮社. Nakajima, Y. 中島, 義道. (1997). 「対話」のない社会―思いやりと優しさが圧殺するもの. PHP研究所.